The CCSLC can exist without footy...it is simply poorer for the omission. But then, that's partially what I'm here for, dammit! The parrot is probably best known as my avatar, but it began life as the crest of a hockey concept in a series I was ill-equipped at the time to truly bring the best out of, and in some ways still am (to put it bluntly: I'd put out an NHL Revivals set back in 04 [and please don't bump that thread...it's 8 years old dammit]. The bulk of those concepts did NOT age well.) 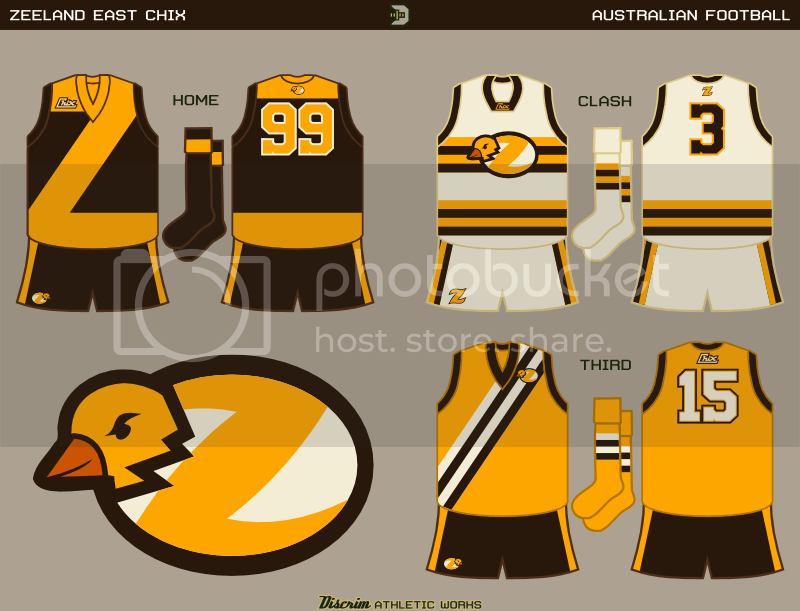 And actually, the whole thing is based on a hockey set I worked on a few years ago but never got around to posting. The one-off...yeah. Reached into my inner Lewiston MAINEiac for that one. Love the home and away, reminds me of the third that Geelong introduced a few years ago but cleaner and better and that 'one off' is out there but awesome love it all ! Chanticleer AFC, New Orleans...yeh, the whole thing would be more at home in Paris than Nola. Oh well, I wanted a few things to post at BF before I got busy on AFL sets, and this was one result. Jumbos AFC, Greater Boston area...Essentially, I had an elephant to burn, but didn't want the A's colors. Thus, just about the least Bostonish color scheme I could've come up with. A tad Bjorkish...cus like this set, she tends to look weird everywhere anyway. Southwest Virginia AFC, Roanoake...Only because despite the rather obvious signs, I didn't feel like saying Blacksburg. 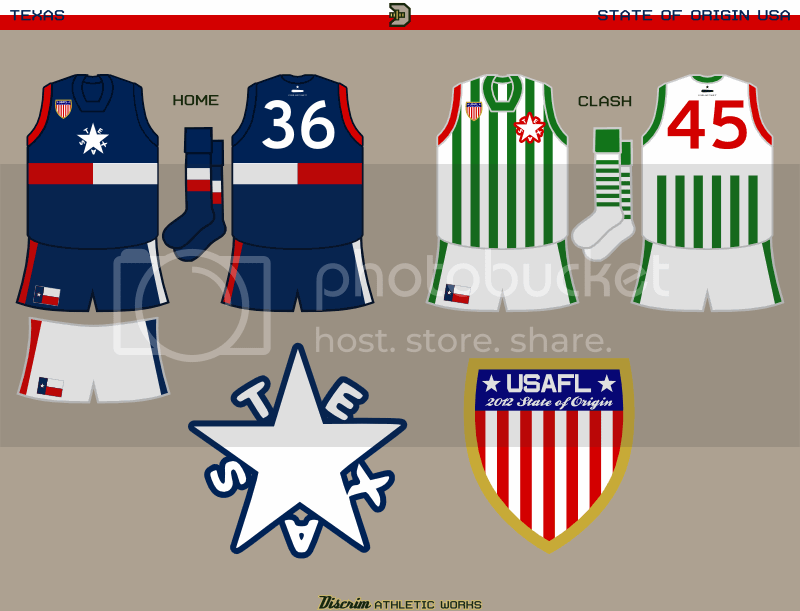 Most of the money's in the east side of the state, however, so the sponsors I would've used in that case made little sense.Granted, I didn't really feel like making the jumpers look all that normal either. The logo is one of my older creations, tweaked a few times over the years. 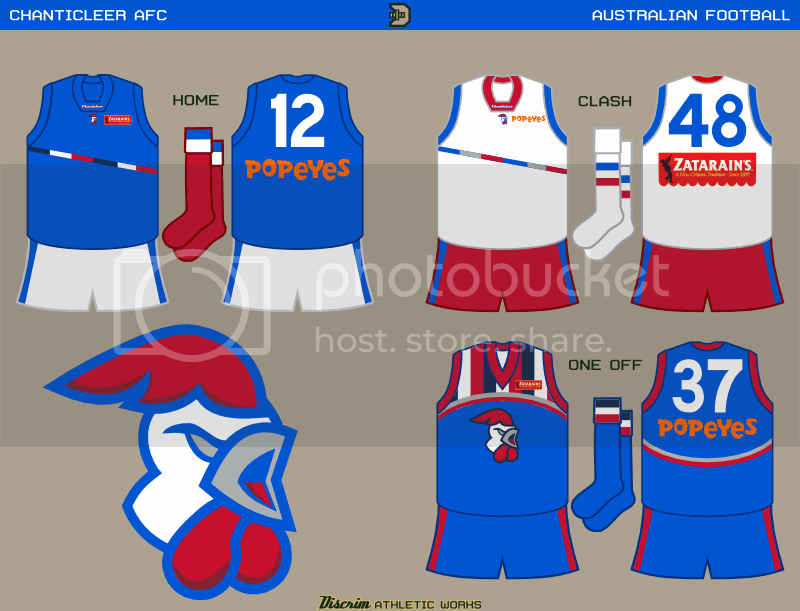 Home jumper is basically what they wear IRL, and the one-off is a modern version of the jumper they wore back in the 1910s and 20s, when they were still in South Melbourne and hadn't gotten the Swans moniker yet (that would be in the 30s, when South had an influx of talented West Australian players join them. West Australia's symbol is the black swan. The rest, as they say, is history.) The white guernseys with the red sash inspired barrackers and scribes to peg them as the Blood Stained Angels. The clash is better ignored...that story for a bit later. Anyways, most number plates, if they are used, are square or a tad rectangular. 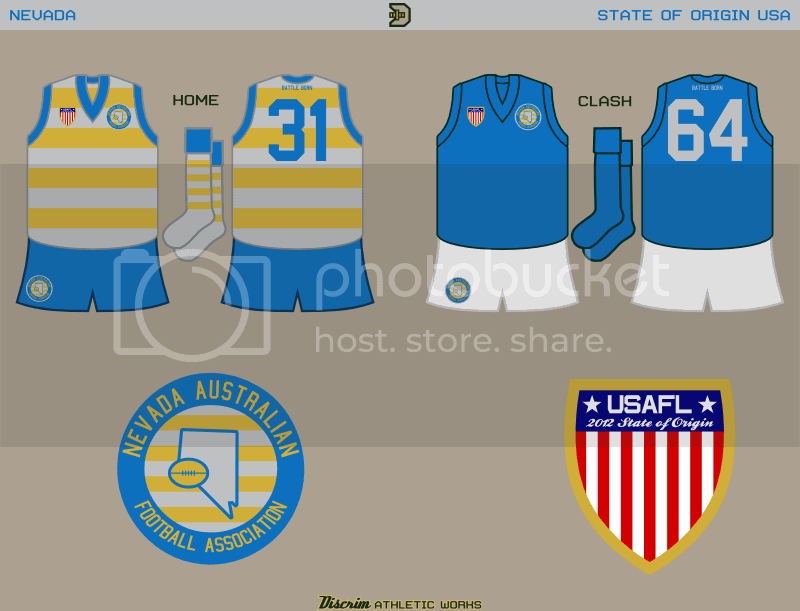 The one on the BSA has the Sydney Opera House as its base, as I was going for something as cool as the SF Warriors' The City jerseys, yet practical. The home, at first glance, is similar to what they wear IRL. However, instead of this being a gold jumper with three brown stripes, it's brown with four gold stripes, something I'd wanted to try out. 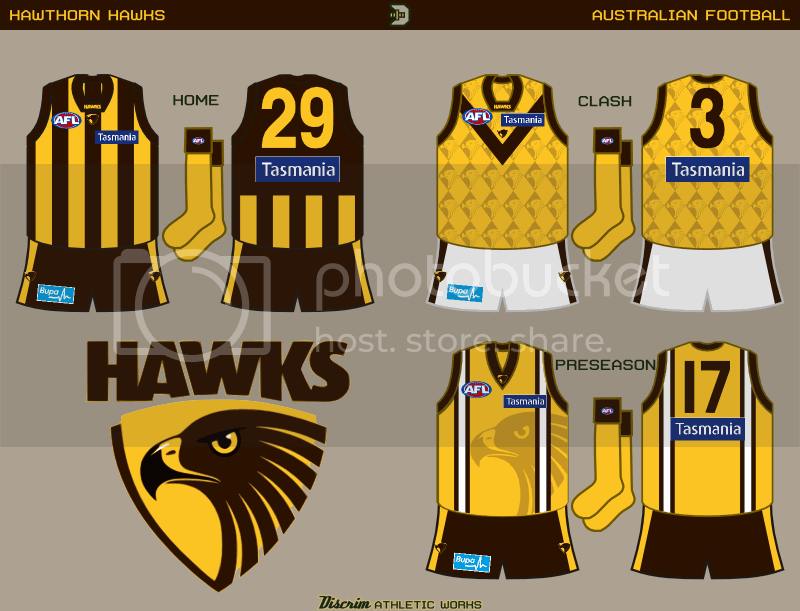 The clash is based on a jumper Hawthorn wore in the thirties, with the modern touch of sublimated diamonds. 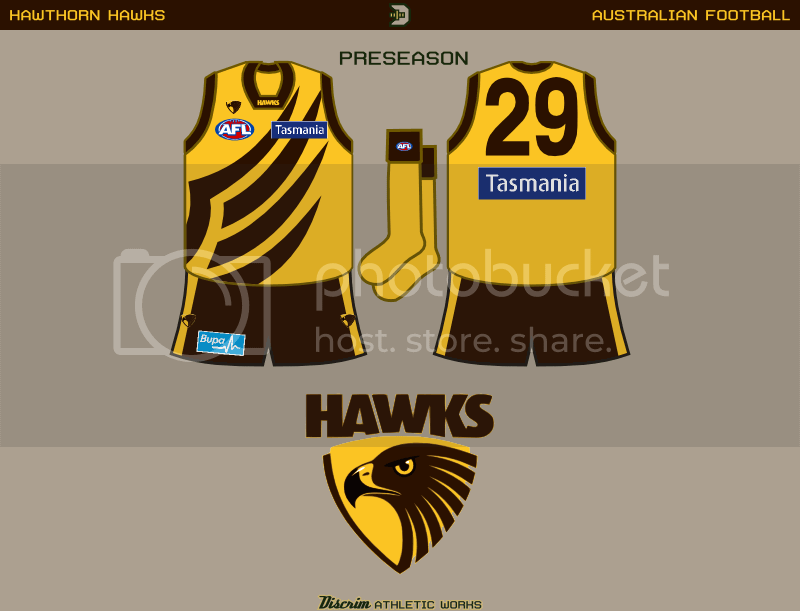 Finally, the preseason jumper is a brown, gold and white version of a predominantly blue guernsey the club wore when it was a member of the VFA (the rival league of the VFL). The big hawk head would be more subtle in real life than here, btw. As happens to me from time to time, it takes me about 15 minutes after posting something for all to see before I realize at least part of said release was ill-advised. In this case, the black jumper that should otherwise not be spoken of. Usually, my "what the hell was I thinking" moments come about due to a design even I think is ugly after the fact. This time, however, it was simply a poor color choice, as Essendon wears a black jumper with a red sash. 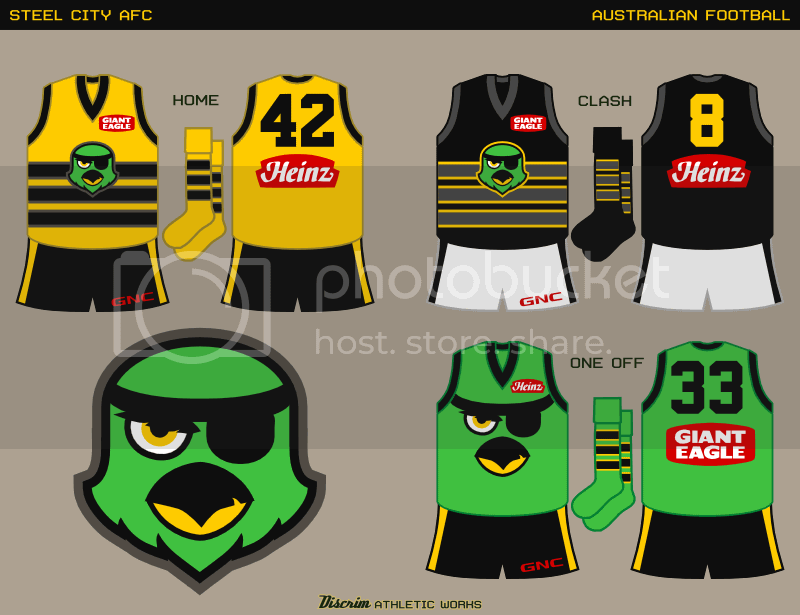 In spite of the differences between the two, the black looked too much like Essendon for comfort. Our old buddy Mero hinted at suggesting what, in hindsight, I shoulda done from the start, and this time out the Bloodstained Angel jumper is the clash. 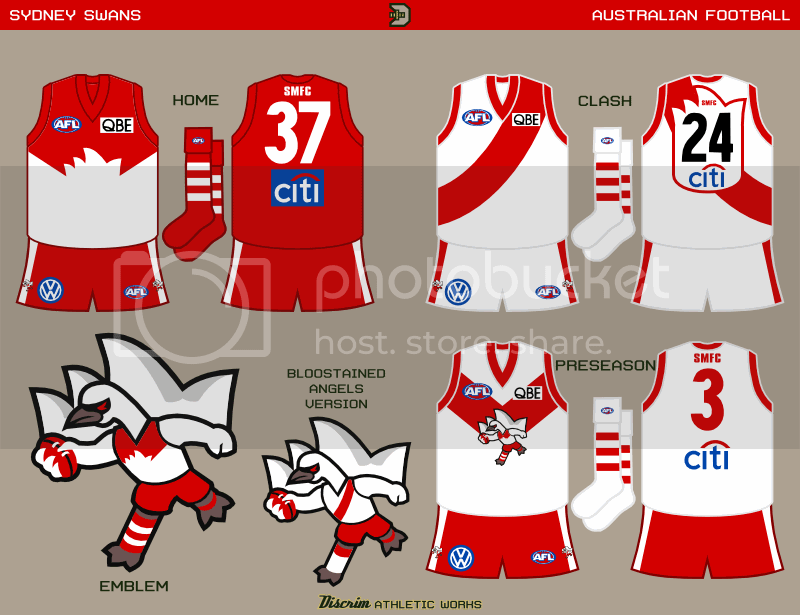 The design I used for the black was a good one, I simply made a rather poor color choice, this time it's white and becomes the Swans' preseason jumper. As I often say, you can't keep a good man (or idea) down, and the home turns the prison bars into an electric fence of sorts. Because Collingwood's always ready to whine, the bars are teal. The away, you can actually partially thank TFoA...see, Flame's in the WAFA like I am, and he wanted a new clash jumper for his team, the Terminus Centurions. Specifically, he asked for a jagged V like either Bayer Leverkusen or Bayern Munich wore recently (I forget which). Unluckily for Flame, I began altering my footy template shortly afterwards until I got to what you see now...eh well, he'll get a redo next season. Anyways, I figured the jagged V made almost too much sense to use for Port, and here it is. The one-off is a Port Magpies heritage jumper. 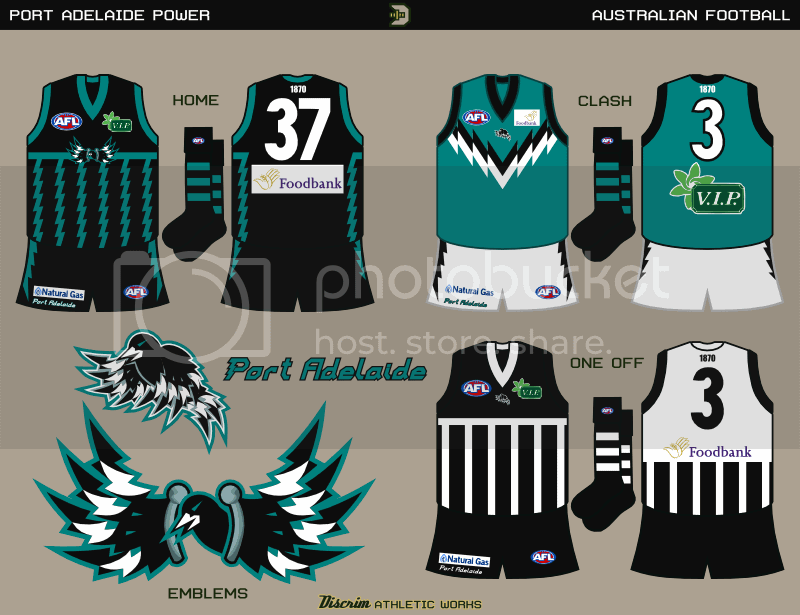 On a side note for those not in the know, the AFL and SANFL Port Adelaide sides were separate clubs until 2011, when they merged into one club. One fortunate side effect for Port is that the club can now sell its prison bar jumpers without being barred from doing so by Collingwood. No, I'm not kidding. Hawks love the elimination of the white box around the numbers, the clash would look good without the sublimated design and the preseason one is a major upgrade on the white alt they use with a hawk on it. "...without being barred from doing so by Collingwood." Nice pun and nice concept! 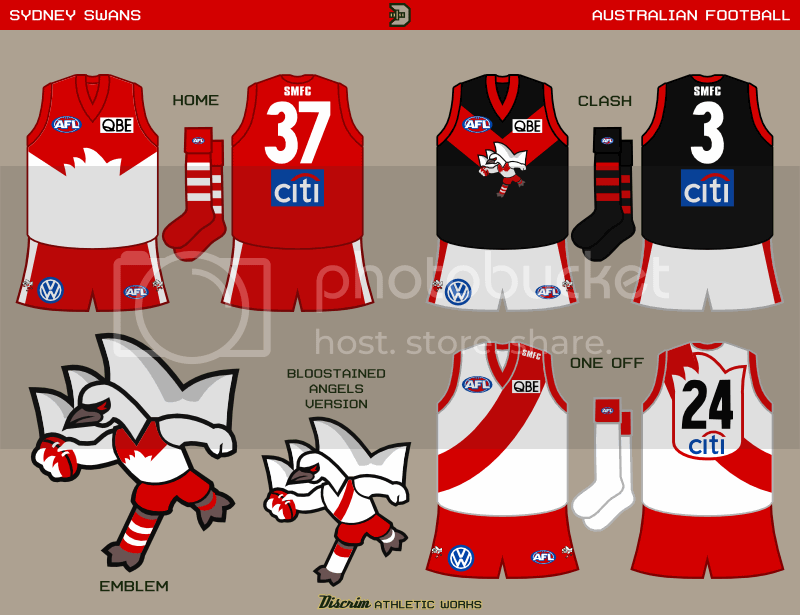 I like the Black and Red set you did, it looks more like a Demons jersey than a Bombers one. Yes that Yellow jersey is perfect no clashing there. The main jersey is nice but i'm not sure about the white panel missing. Yes this is the nice way to go as people don't like change, i liked the Black and Red set as it mixed it up a little. My favourite out of the 3 independents is the Rooster one, send it into the North Adelaide of North Ballarat Roosters. LOVE the Port set! I really like the clash Hawthorne jumper as well. Lancealot: Far as Sydney and Port go, the emblems are among the ideas I've had that I felt had aged rather well (compared to a number of other old concepts of mine...the handballing swan, I've found to be rather adaptable for many uses, and Port's was my way of enabling them to use the magpie at the AFL level, even if they can't use the name (though while I was working, I found myself considering retiring the full magpie in favor of the head/coils version). Far as their actual logos go, I'm rather ambivalent of Sydney's, but always thought the Power could do better than what they have (not that I don't see what they were trying to do)...and like I said, I like the jumpers Port has IRL now, you guys finally got it completely right for once. Now as far as Hawthorn goes, wish granted. fumbler: taking an umptheenth look (cus the second and third looks were taken last night, and I lost count), yes, there's an unintentional Dees resemblance with the jumper alone...though then you take in the fact that I chose black, and basically the same socks as Essendon. 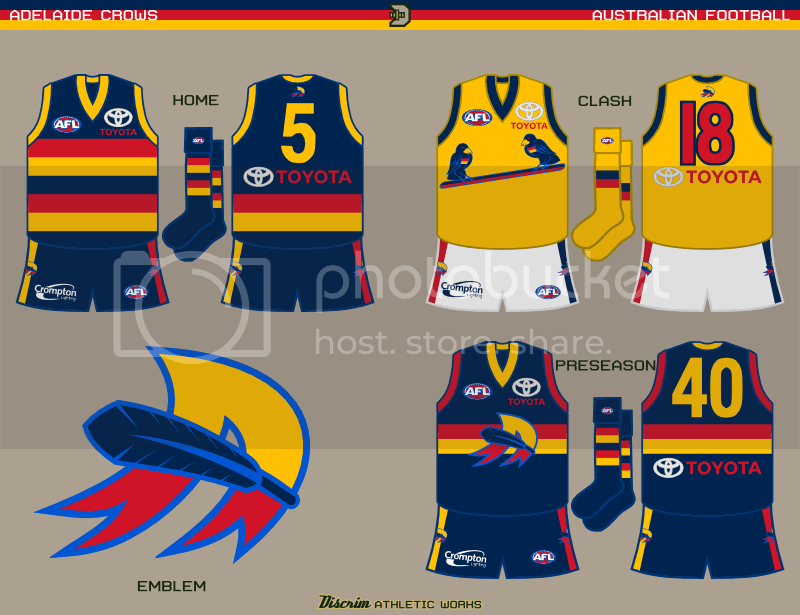 No matter which way you put it, that was 1) stupid on my part, and 2) WAY too close of a resemblance to either Melbourne or Essendon for comfort. You could argue that the Dees and Bombers are run by more reasonable outfits than Collingwood, or that it likely wouldn't be worn against either of them anyway, but still. Basically a brainfart on my part, I know this and STILL put this out. Far as Hawthorn goes, like I said I felt a brown back, as well as an extra stripe, would be worthwhile to try, and I know the number panel's vintage, but I don't feel they really need it. And as far as the rooster set, thanks for the idea, as I've had my eye on a few lower level clubs for a while now. If nothing else, I finally have something to use when I get around to Airport West. 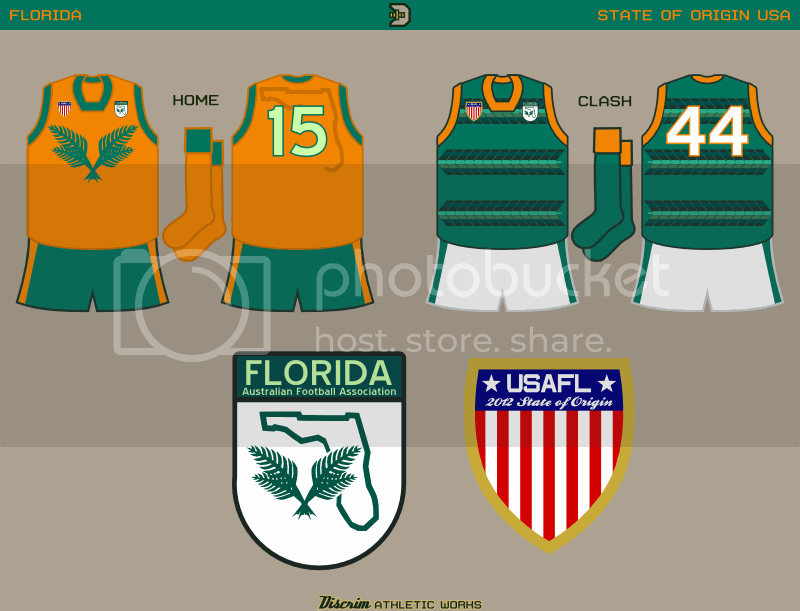 Basically, instead of the traditonal stripes, it's a stylized hawk wing. Granted, it's more horizontal than vertical, but it was worth a shot. I liked the braces too much to drop that one from the normal set, so this one was posted standalone. Considering how often I seem to post Zeeland sets, you'd think I went there (not even from Michigan, let alone Zeeland...every nickname used by Racine high schools is rather common, while the Chix stand alone). If it's wrong to be in love with my own work, I don't wanna be right. Anyway, the home combines a yoke, sash and hem stripe to form a big Z (hey, I've done a big N jumper for Nebraska, why not a big Z), the clash is cream and is basically a footy version of a hockey jersey I posted several months back, and the third uses the striping pattern of the clash for a sash. The Crows did something when they began play that almost nobody does: they got the jumpers right on the first try. In recent years, IMO unnecessary side panels have occasionally stuffed it up. 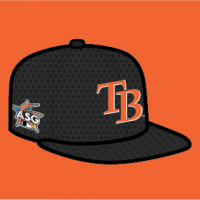 I honestly can't imagine doing anything notable to it that wouldn't ruin its overall look...the logo they use IRL, however, is crap. Everytime I look at it, I can vividly imagine how they turned the Baltimore Raven into a blue crow. That said, I dipped back into my archives for something I've been thinking of doing for a while. The A logo is based off of one of my older concepts, and uses a crow feather to cross the A. The clash, it's heavily inspired by the St. Louis Cardinals, though since obviously they don't use bats in footy, a ball would be rather lame, and the goalposts would be rather awkward, the two crows are perched on a rather thin stripe instead. I might post variants of the birds-on-stripe jumper a bit later, and I'll likely be using a thicker stripe if I do. I love how there's a Chix and a Dux in the same town. Arizona has some oddball mascots too. Thanks to the MaxPreps "Mascot Monday" series I know exactly which ones are unique nationwide ? Gila Monsters, Criminals (that's a fun one), Caballeros, Dorados (using sorta-Aztec-like imagery), Sand Devils, Monsoon (and likely Monsoons, both of which are in use), and a couple others. *Some historical facts are missing: Arizona once had a Redcoats (one of two in the country), a Beavers, a Red Devils and a Green Devils, and a Muckers (!). In addition some CAA schools are missing, including another unique name in Monsoons (Heroes is there though?). Basically, bits and pieces of various Texas flags were taken to make this set: the requisite Lone Star, a Stephen F. Austin design, one of the Bonnie Blues, the Goliad Bloody Arm, and the Come and Take It flag are all referenced to. 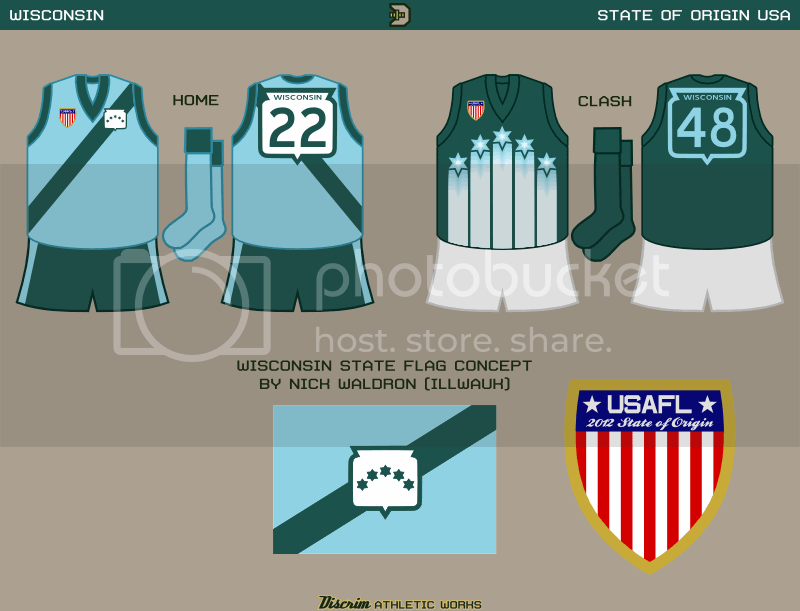 A few years ago, illwauk posted a Wisconsin flag redesign in General Design. Shortly afterwards, I used his flag as the basis of a Wisconsin state of origin guernsey. Fast forward to now, and I'm revisiting USA State of Origin. It was only natural that I go this way again. Yeah, I know, silver and gold aren't often paired together...which is precisely why I paired them together. You could say the clash is rather boring, though simply a solid color with nothing on the chest is rather rare in footy, and it seems to work for South Australia's Norwood. Texas: I would lose the letters around the star makes it look super cluttered on the uniform, I would also change the colour of the number on the clash to either navy or green, I think navy would work better as ago numbers are pretty much either navy black or white. Home: no brainer here, Big Dipper + North Star = boom. Clash: Alaska's like Mike Love most of the year: cold as hell, hence the colors. The curved hoops...curved em upwards as a small nod to the Midnight Sun. Figured one design would be best here...home is copper, clash is turquoise, as where you can find one, you'll probably be able to find the other. Three word explanation for why the home doesn't look like the old NHL Rockies: Purple. Mountain. Majesty. The clash is simply shaped like itself. 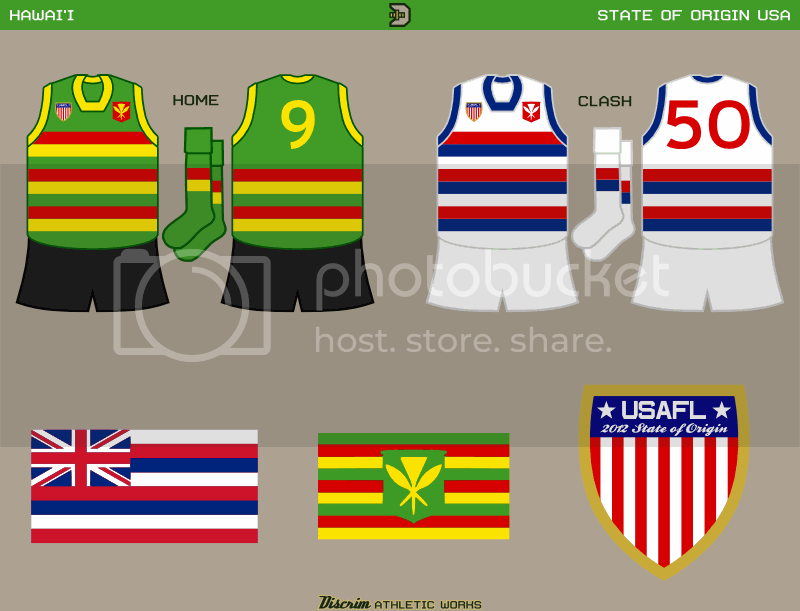 The home jumper is based on what have been claimed to be King Kamehameha III's personal colors, the clash is based on the present state flag. The former simply seemed to be a better first choice, tbh. 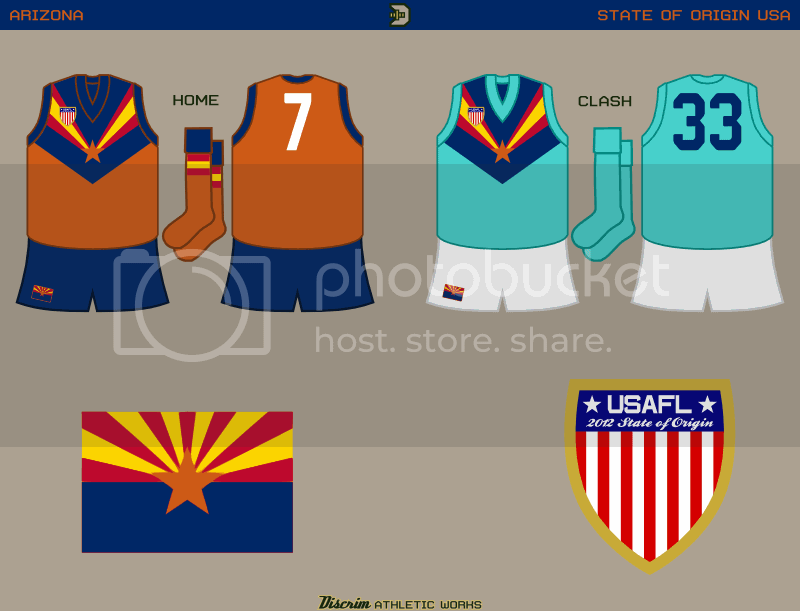 Discrim, I began making footy concepts for Arizona high schools. Thanks a bunch; this is infectious! I keep on hand tracing your template ? and have done so a couple dozen times already. P.S. 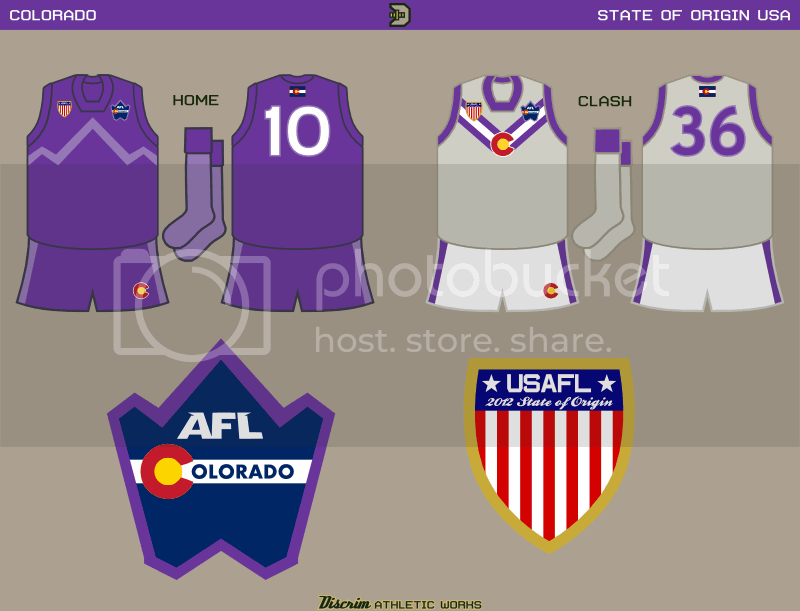 Your Colorado concept reminds me of something I whipped up the other night that I'll be posting soon. I don't know where to reply, here or BF. Just too many to comment on. Excellent stuff, love most of them. Each has a Discrim touch that is always unique. SoO series is going well Discrim, Hawaii is my favourite now. They keep getting better! 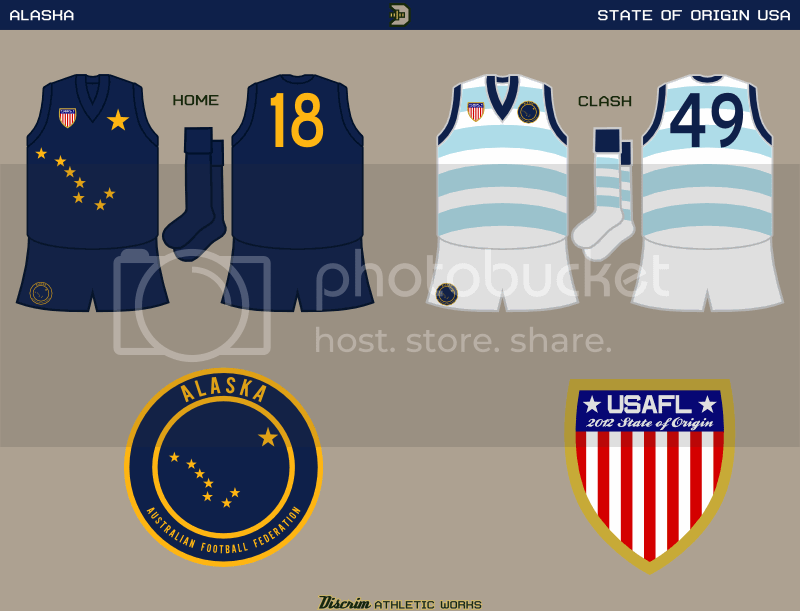 Alaska and Colorado are great, the unique designs work really, really well for them. Alaska's clash and Colorado's home particularly strike my fancy. The former makes me wonder why nobody's ever done curved hoops before (at least not that I've come across), while the latter just looks great with the mountain stripe and the two-tone purple. Hawaii is really nice too, just for the color scheme alone. I really like Arizona's home, but the clash rubs me the wrong way. I feel like the turquoise and the rest of the colors just, well, clash. The design of it I think is brilliant, though. Going back to the first batch of SoO, I'm loving Nevada's gold and silver as much as you are, but while it looks great, I wonder if a darker shade of blue might be worth experimenting with. I'm a big fan of Wisconsin's color scheme, and of the designs you gave their guernseys, especially the originality of the clash. The numbers might be a bit more legible if it were dark-blue-on-white like the home, though. I'm really digging Texas' half-and-half stripe, I think it's a great look for a state that's got a lot of history but prides itself on being just a little bit different from everyone else. I agree with lancealot about the star: The letters around it make for a great logo, but once you put it on the actual guernsey, it does look too cluttered. (Also, once I noticed that the white of the star and the white of the X touch, I couldn't stop staring at it. Just a tiny thing, but thought I'd mention it.) Florida... can't say I have a whole lot to say about it, other than it looks great! WD40 WLD42: I figured one thing with Colorado, if/when I finish, there will be plenty of blue states, but not that many purple states. 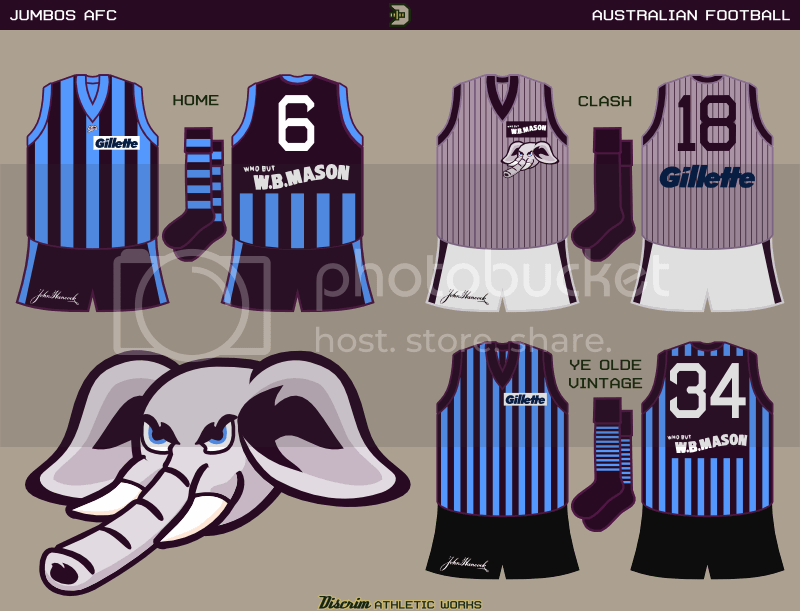 Barring any convouluted for Alabama, it'd likely be the only use of purple here; curved hoops, true, apart from that Geelong heritage jumper (and that one's only partial, and rather debatable whether that part would qualify) I haven't seen em in real life, or any concepts aside from my own. 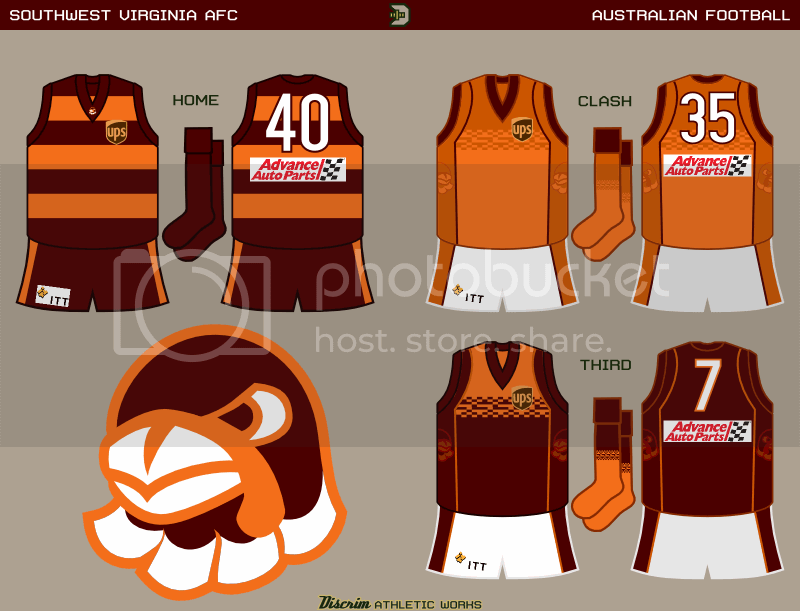 And this is considering most footy clubs wear printed guernseys, and we've seen Port wear a realistic lightning bolt, and various teams put everybody and their mama's names on the jumper for various reasons. And Orbost Snowy Rovers wears jumpers with a freakin river on them. Love it man! I really wish I understood footy.